A little known fact: If you are WAY OVERWEIGHT, which generally is consider 50+ lbs or more, you have a much higher risk of developing cataracts! Yet another fact: If you were exposed to lead (lead plumbing etc) your chances of becoming fat are much higher than someone who's not exposed. You'll probably be shorter than average, no matter your genetic make-up if exposed to lead. The map depicts the population of the USA by BMI index. As you can see Colorado has the lowest mean Body fat. 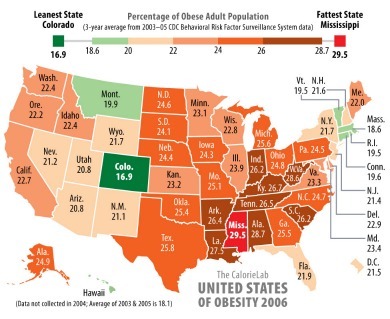 And Mississippi has the greatest amount of fat people/state. It seems the states with the least amount of people have the lowest BMI's. ...With exception of New York and Florida. 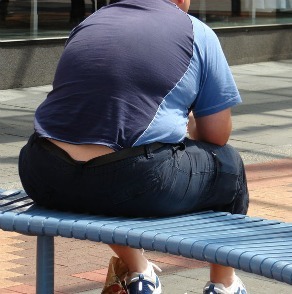 Obesity Not Just and Adult Problem Anymore! 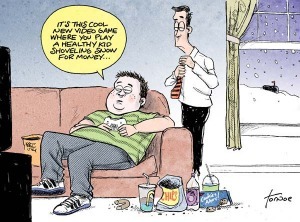 Since the 1970's a steady rate of fat children has risen from 8% of teens to 12%. Lack of exercise being the biggest contributing factor. To much time in front of a TV. Wrong foods eaten, to much sugar and processed foods. A study done back in 2004 on the relationship between obesity and High-fructose corn syrup. A study done at Louisiana State University. Explored the relationship between consuming high-fructose corn syrup (HFCS) and the onset of gaining huge amounts of weight and eventually obesity. The use of and consumption of HFCS from 1970 to 1990 has exploded at 1000%!!! Making it the greatest jump in usage of any other food group. Even more than fast food hamburgers. All soft drink are sweetened with HFCS!! The increase in HFCS consumption correlates with the rise in overall weight gain!! The average American ingests 315 calories of that crap daily. Naturally simple sugars, we get from fruits and vegetables, they are converted into glucose and enter the blood to be escorted into the cells with the aid of insulin. The digestion and absorption of High-fructose corn syrup differs from the digestion and absorption of glucose. Insulin is need for cell nourishment if there is NO production of insulin by HFCS…it literally means NONE of the food sweetened with HFCS is entering the cell where its needed! Insulin and leptin regulate food intake and body weight. HFCS supports Lipogenesis (fat production). That dietary fructose is a likely contributor to the huge jump in weight gain in the US. HFCS sweetened beverages may also augment caloric over-consumption. People drink more ounces of beverages laced with HFCS because it stimulates the “Hunger Factor” to continue on after hunger has been well satisfied. HFCS may have a direct impact on the obesity epidemic here and in other countries where it is widely used as an ingredient in processed foods.